A long time ago — roughly four decades — the world was introduced to Jedi knights, lightsabers, droids, Wookies and the Force. "Star Wars" exploded into movie theaters in 1977, and it became an instant hit, eventually spawning a pop-culture empire, including sequels, prequels, books, comics, video games, television series and radio shows. Before long, elements of the space fantasy had an effect on real-life space technology. Below is a brief overview of the franchise and its effect on space technology in the decades since. The "Star Wars" franchise is divided into three sets of films — the originals, the prequels and the sequels — as well as myriad off-canon television series, video games, radio shows and other forms of media. In this article, we will focus on the films. The tale, from "a galaxy far, far away," concerns the adventures of young Luke Skywalker, the nephew of a moisture farmer who lives on a desert planet. Luke learns that he is adept at harnessing the Force, described as an "energy field … that binds the galaxy together." He eventually joins the rebellion against the Galactic Empire, along with his newfound allies — two robots ("droids"), C-3PO and R2-D2; Obi-Wan Kenobi, a Jedi knight in seclusion; a smuggler, Han Solo, and his Wookie co-pilot, a large sentient beast named Chewbacca; and a princess and rebel leader, Leia Organa. Luke also encounters Darth Vader, a Jedi knight who has fallen to the dark side, and (— spoiler alert! —) turns out to be Luke's father. With the help of his allies and others in the rebellion, Luke destroys the Death Star, a planet-killing satellite, as well as its bigger, more powerful replacement. In a final showdown, Luke confronts the Emperor and battles Darth Vader, who redeems himself by turning against the Emperor and aiding his son. Lucas also released three prequels between 1999 and 2005 — "The Phantom Menace," "Attack of the Clones" and "Revenge of the Sith" — to chart the path of Darth Vader's rise and fall, and the birth of Luke and (—spoiler alert! —) his twin sister, Leia. In 2012, Disney announced that it would take over the franchise's production and pledged to release several sequel films to the original series. The first of these films, "The Force Awakens," premiered in December 2015. It is set many years after "Return of the Jedi" and concerns the aftermath and legacy of the Empire's defeat. As popular culture became entrenched in "Star Wars" references, words, phrases and ideas from the franchise entered the vernacular of science and technology. In 1983, President Ronald Reagan proposed the Strategic Defense Initiative, which would use ground- and space-based lasers, particle beams, missiles and other weapons to help protect the United States from attack by nuclear missiles. Critics derisively referred to it as "Star Wars." The defense system would have some parts of it based in space. One idea, according to Encyclopedia Britannica, was Earth- and space-based laser systems that could (simply put) shoot down missiles before they reached their target. The proposal also called for surface-to-air missiles placed beside strategically important locations (such as ICBM silos). The program led to the development of items such as the Extended Range Interceptor, which successfully caught a missile in-flight in testing in 1987. The U.S. Army also had a successful hit-to-kill on a target on the fourth try with a Minuteman missile, in 1984. The program was eventually abandoned. There were concerns that the program violated the anti-ballistic missile treaty that was part of the Strategic Arms Limitation Talks, according to the Cold War Museum. The program was also killed due to budget cuts and lack of results. After $30 billion spent, no laser and mirror system was ever used. In 2007, shuttle Discovery launched Luke Skywalker's lightsaber into space to commemorate the 30th anniversary of the franchise. The ceremonies on the ground surrounding its handover to NASA included appearances by Chewbacca and Imperial stormtroopers. The first-generation Robonaut looks more than a little bit like the bounty hunter Boba Fett from "Star Wars." 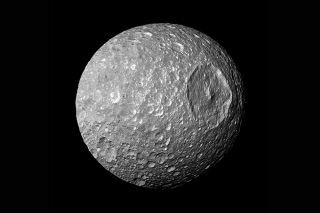 Close-up images of Saturn's moon Mimas in our own solar system showed it looks similar to the Death Star, which had a distinctive circle on one side of its sphere shape. In real life, the moons that have these large circles are actually showing off the remnants of a large asteroid smacking into the surface and leaving behind a crater. NASA has also referenced "Star Wars" when talking about the moon Iapetus, which also orbits Saturn. "The moon Iapetus, like the 'force' in Star Wars, has both a light side and a dark side," the agency wrote in 2015. "Star Wars" is also referenced frequently when speaking about planets with two suns, similar to Luke's home planet, Tatooine. Most of the planets that orbit two stars are huge gas giants, but a handful of planets similar to Earth have been found as well, such as Kepler 16b, Kepler-34b, Kepler 35b. In 2015, a study from the University of Utah suggested these sorts of planets might be more common than was once thought. Simulations showed it was possible that planetesimals — the precursors to planets — could safely orbit in an oval around two stars without necessarily crashing into each other. A TIE fighter from "Star Wars." Today, there is a real-life R2-D2 — at least the 21st-century equivalent of it — on the International Space Station (ISS). NASA's humanoidRobonaut 2 is sometimes called R2. It is still in testing, but R2 is intended to flip switches and do other simple science experiments and free up time for the astronauts to do more complicated things. In the future, NASA hopes to outfit a version of the robot to do work outside the space station, rather than sending astronauts out on risky spacewalks. In 2006, NASA launched a set of droids to the space station to test synchronized flying in space, and the technology was used by several ISS crews. The droids are intended to be aware of each other and to synchronize their flying so as not to crash into each other, which is technology that could be useful for satellites. In "Star Wars," robots like these were used for lightsaber training. Solar panels: The Empire's TIE fighter spacecraft appear to have solar panels on their outer hulls, which is a technology that NASA uses for many of its Mars probes (including the Opportunity rover on the surface) as well as the International Space Station. Solar panels are most useful on spacecraft that are closer to the sun. This means that a mission such as Rosetta — which chased a comet beyond Mars' orbit — had to have extremely large solar panels to catch the sunlight required. Spacecraft operating farther away require nuclear power. Lasers: While lasers are used for combat in "Star Wars," NASA is testing using lasers for high-speed communications between space and the ground. NASA's Lunar Reconnaissance Orbiter probe, for example, tested out a laser system from the moon and received a picture of the Mona Lisa sent from Earth. NASA is discussing doing laser tests from the International Space Station to increase the flow of communications from the orbiting complex. This would be particularly useful for experiments, which send out quite the amount of data for investigators back home.